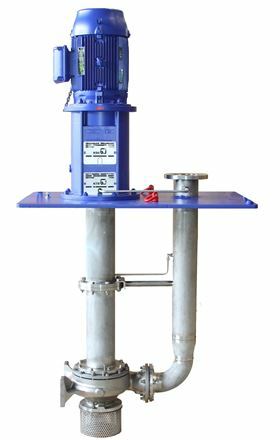 International pump manufacturer, KSB, has introduced the Estigia type series of low-pressure suspended pumps for the chemical and petrochemical industries. The new pumps will be showcased at this year’s ACHEMA trade fair, taking place in Frankfurt from 11 – 15 June. The pumps are designed for vertical wet installation in a closed tank under atmospheric pressure. For the installation depth, various lengths ranging from a minimum of 852 mm to a maximum of 6402 mm are available and three discharge pipe diameters can be selected for each pump size. The casing cover of the pump is fitted with a product-lubricated plain bearing made of high-grade, wear-resistant silicon carbide and the the pump set is easy to install and dismantle with its integrated cover plate serving as the tank cover. Materials available are cast iron, stainless steel and duplex steel. The pump set can be supplied with shaft bearings lubricated by the fluid handled, an external liquid or an electric grease pump. This version is designed to ISO 5199, with flexible coupling and grease-lubricated rolling element bearings arranged outside the fluid handled. The pump is suitable for fluid temperatures of -30 °C to +100 °C. It can be driven by variable speed and fixed speed electric motors, with or without ATEX approval. KSB has sold its KSB AMRI Inc subsidiary to Bray International Inc with effect from 31 January 2017.